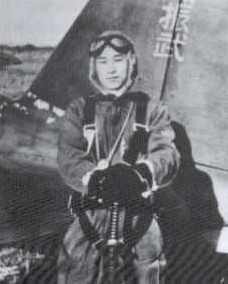 On April 3, 1945, Second Lieutenant Hiroshi Maeda took off from Chiran Air Base as a member of the 23rd Shinbu Special Attack Squadron and died in a special (suicide) attack west of Okinawa at the age of 23. He piloted a Type 99 Assault Plane (Allied code name of Sonia). After his death in a special attack, he received a promotion to Captain. He was from Hokkaidō Prefecture, attended Risshō University in Tōkyō, and was a member of the 1st Class of the Army Special Cadet Officer Pilot Training (Tokubetsu Sōjū Minarai Shikan) Program. I have received an Imperial command to go. For more than twenty years until today, I received kind affection. It is inexcusable that I could not show any filial piety at all and that I caused you only worries. I warmly thank you. I will die and become a Pacific Ocean breakwater for the Emperor. There is nothing that surpasses this in honor for a military man. I am full of vigor and in high spirits. Please rest assured. Regarding today's honor, for a subject like me I know that the honor is more than for the body. Even though my corpse will vanish in an enemy ship, my spirit will be in the realm from time immemorial and will protect the Empire's foundation. It can be said that there is worth for a military man, having been born in the country of Japan, to fall for the Emperor as His supporter. However, offering one's life is the great cause and moral principle for a Japanese subject. Also, it is the duty of a military man. First, for a military man, one must make it a duty to serve loyally. I push forward with the moral principle of loyalty to the Emperor and filial piety to my parents, which are two halves of the whole. I am determined with my death to repay one ten-thousandth of the great kindness of the Emperor and my parents that is taller than the mountains and deeper than the sea. Finally, I pray for the health of Father and everyone. My own grave is not really necessary. Please let me sleep quietly beside my deceased mother's grave. Farewell. Long live the Shinbu Unit. The letter and poem come from Muranaga (1989, 58-60). 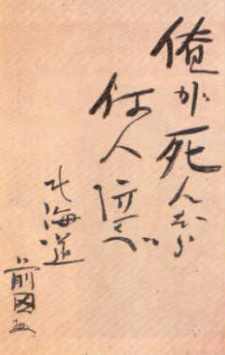 The biographical information in the first paragraph comes from Chiran Tokkō Irei Kenshō Kai (2005, 99, 153) and Osuo (2005, 195). The image of the actual death poem above is from Kawatoko (2008, 18). Kawatoko, Takeshi. 2008. The Mind of the Kamikaze. Minamikyūshū City, Kagoshima Prefecture: The Peace Museum for Kamikaze Pilots.